The boardroom is where it all happens; this is where the big decisions are made and the big discussions take place. But it’s not only the role players and their ideas that should impress inside the conference room. Choosing the right furniture to suit your brand and conference room space is crucial for those first impressions and long hours spent brainstorming or negotiating. The most important piece as the focal point of your boardroom should be the conference table. There is nothing more elegant and powerful than a contemporary glass conference table. You can choose from various finishes such as scratched glass, clear, clear with patterned border, etc. What do you want your furniture to say about your company services as well as culture? What is your brand image? Your office furniture, especially your conference room furniture, should be reflective of your company. An edgy advertising agency should use a design that makes a creative statement, whilst an attorney’s office should focus more on a design with sturdy, powerful edges. 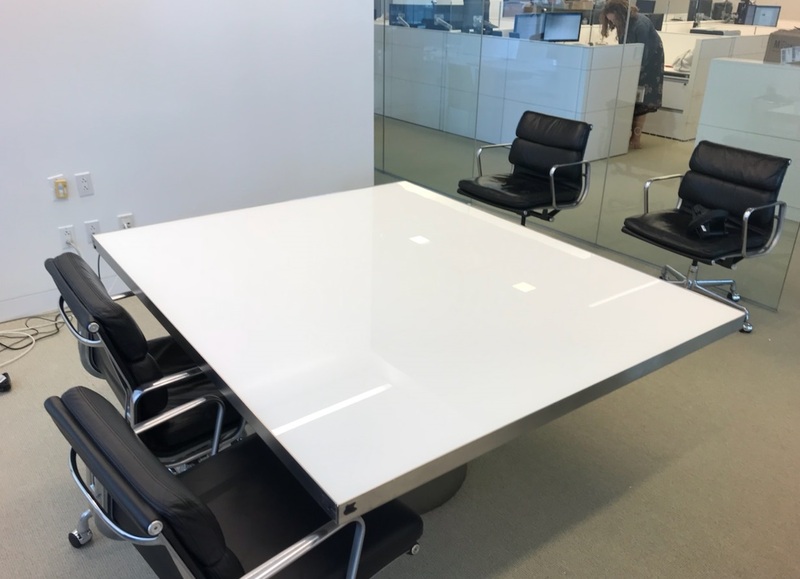 It might look amazing and make a great impression, but if the size isn’t practical, your glass topped conference table can easily become the biggest headache in your conference room. Take the available space into account. No matter how beautiful – nobody can get work done in cramped space. 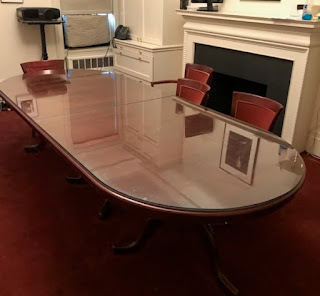 Will the glass conference table be used for presentations? Be sure to choose a design that includes wiring and data ports. Will the table’s main function be to hold board meetings? Oval and circular tops allow for more people to be seated without necessarily taking up more area space. With these helpful hints, choosing the correct glass table top for your conference table should be an easy and enjoyable experience. But keeping that special, conversation starter clean can be quite a daunting task. Some cleaners can attract dust, while others can leave a greasy film. And then there’s the issue of preserving the color and detail that makes the piece unique and extraordinary. It’s enough to make your mind spin. Yet, before you throw in the towel on your lump o’ timber, consider a glass tabletop. A custom cut and sized piece of glass on top of your wood table may just be the answer to your wood woes. There are actually a lot of benefits to a glass tabletop that you may not have even thought about. Glass tabletops can be stylish. 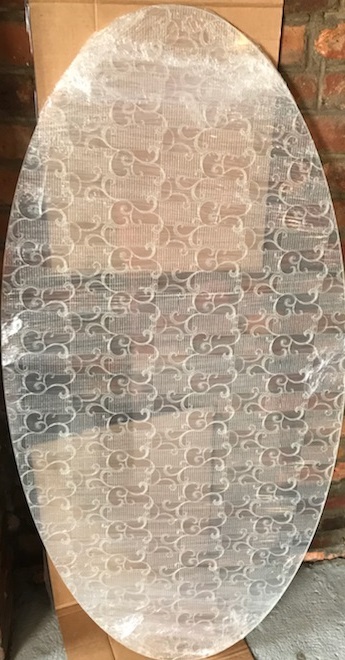 The glass tabletop edges can be custom cut to give your tabletop an elegant and sophisticated motif or a fun and trendy vibe. Glass tabletops can protect against harmful UV rays. Your skin isn’t the only thing the sun can damage. Tinted tabletop glass can provide your nice wood furniture with a sunscreen, of sort, that will protect and prevent sun damage. Glass tabletops can prolong the life of your wood furniture. Water rings, scratches and even sun damage can age your wood furniture prematurely. A glass tabletop can protect from daily wear and tear and can help safeguard the characteristics that make the piece special. Glass tabletops are easy to take care of and keep clean. All you need is a dry, clean cloth and a spray bottle full of water or glass cleaner to keep your glass squeaky clean and shiny. And of course, Glass and Mirrors can help you with all of your custom glass tabletop needs. Give your us a call and we will help you. Again, bathrooms aren’t the only rooms that need a good mirror, but it is probably the most common place where mirrors are found. 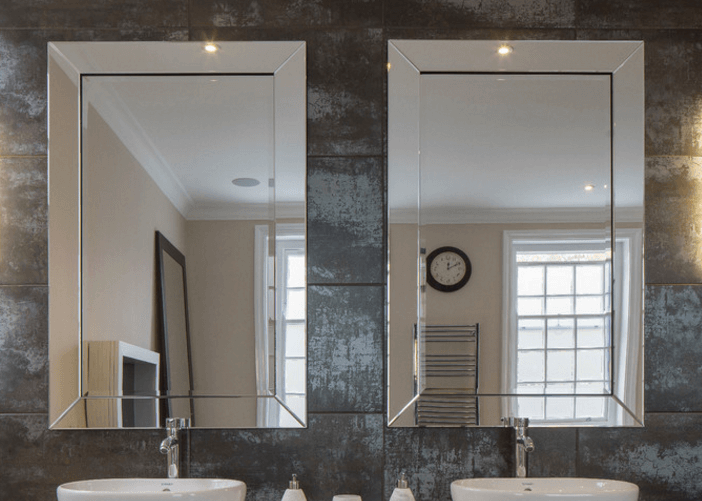 Though this may seem pretty straightforward or limiting, there are a few things you have to think of before you choose the right vanity mirror. Is there enough light around the mirror? If not, you’ll have to figure out how to add more light to the vanity during the installation process. You can do this by adding more lights to the bathroom. Some mirrors even have LED lights that create a back light effect behind the mirror. This is a good way to turn your mirror into the focal point of your bathroom, but the light could also be slightly distracting when you’re getting yourself ready for the day. Adding a frame to your mirror is a good way to stylize your mirror with your favorite mirror design ideas. For example, thick wooden frames have a more country or homey feeling while thin frames look more modern. Large floral frames are very eye catching and colorful frames are lighthearted and bright. You can also stick to a frameless mirror. 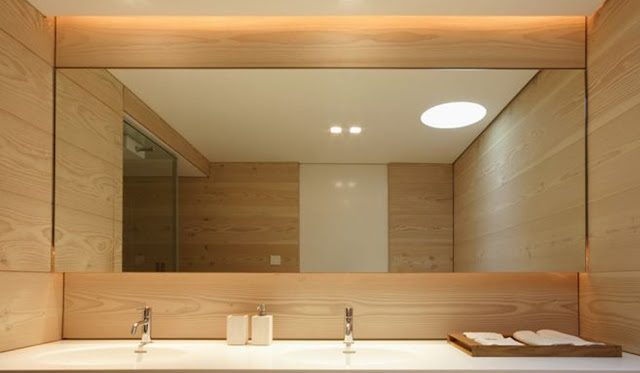 This kind of mirror can still look nice, and it’s a great fit for a minimalist bathroom. If you have a double vanity, you can hang a mirror over each sink or one giant mirror that covers the entire wall behind the vanity. It all depends on what look you like better. A plane mirror is the type of mirror found most often in the home. It’s a flat mirror that reflects an image in its normal size and shape. The best thing about mirrors is they’re useful and beautiful. Most people have at least one mirror in the house. But mirrors do more than help you check your reflection before you leave home. Mirrors add decorative touches, bring light into a room, and add spaciousness. Do you live in a small apartment or condominium? A mirrored wall is a great way to bring in natural light and add depth to a room. Mirrors make the room look bigger. In a small apartment, hang full-length mirrors across the span of a windowless wall. Don’t worry about losing functionality because the wall is covered with mirrors. If you work at home, put your desk against the glass. The reflective quality of mirrors makes them great for bringing light into a dark space. Be strategic in your placement of mirrors, and you’ll see more light reflected in your rooms. A small dark bedroom is a perfect place to add a mirror. It doesn’t have to be an entire mirrored wall. It doesn’t have to be a big mirror. Hang a small decorative mirror opposite a window to add light. The entryway is the perfect spot for a decorative mirror. If you have a small or large entryway, try a mirror. This way you can check your look before leaving the house. 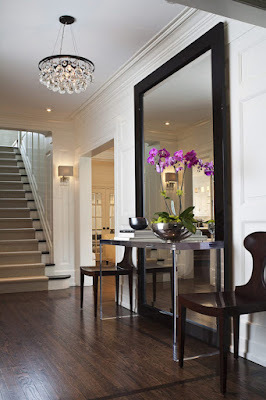 A decorative mirror in the entryway enhances the light. Most people don’t think to use a mirror in the kitchen. But what about a mirrored backsplash? A backsplash brings light into the kitchen. It makes a small kitchen appear larger. And a mirrored backsplash is easy to clean. Mirrors bounce light to make any room brighter and therefore, appear larger than they are any time of day. Additionally, they also create the illusion of more space in any area. Placing a mirror near a window or well-lit area are ideal to creating the concept of more space. Consider using decorative mirrors or furniture with mirror panels like consoles or side tables already incorporated in its designs. 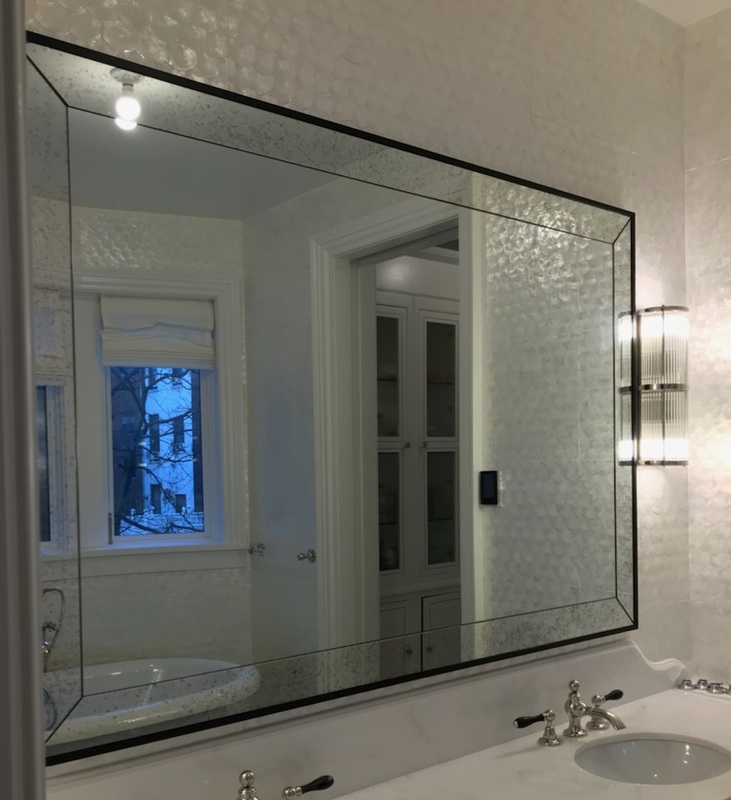 We’ve completed quite a few custom mirror projects that were both functional and beautiful additions to our clients’ homes, so don’t be afraid to get creative with design. 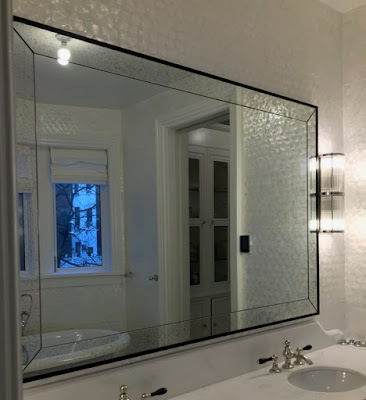 Bathroom Inspiration: This is an obvious one, but sometimes home owners neglect that they can install a full length mirror, which covers one complete wall and instead choose a more smaller, standard sized mirror. 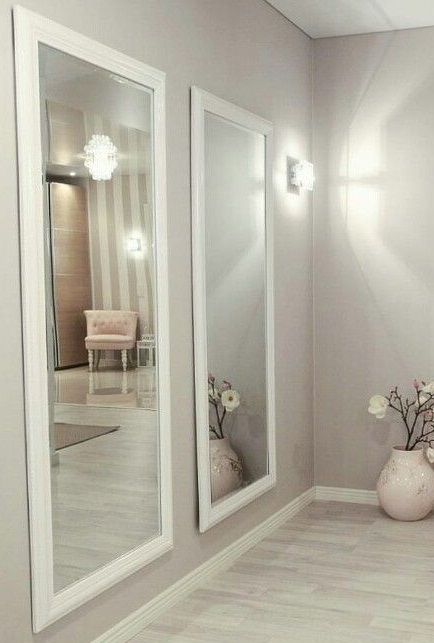 Adding an extended length mirror means more light reflection and the illusion of more space, while also allowing for more than one person at a time to use the mirror. Kitchen: Consider installing mirror panels along the interior wall of a small kitchen instead of your typical kitchen tile for a more impactful backsplash. Bedroom/Hallsways: Mirrors in the bedroom and around the home are most commonly seen as mirrored closet doors and place particularly well in narrow hallways or by the entrance way for a quick check on your appearance before you head out of the house or for guests entering in. The transparent nature of glass gives the illusion of a wider, open space, instead of feeling closed off with spaces partitioned by a standard wall or door. Letting in lots of light, particularly natural light helps to open up a space, and glass is the ideal sound and weather proof barrier to help you accomplish that. 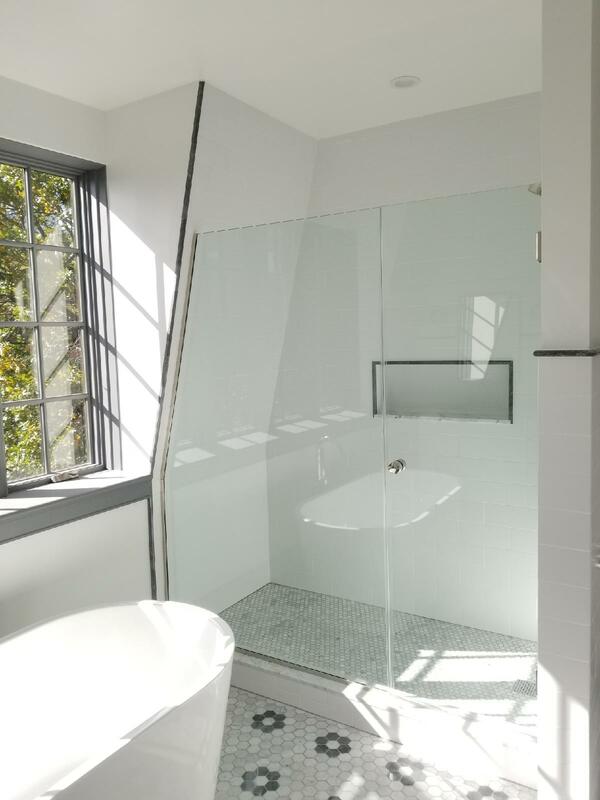 Bathroom: It’s extremely common for us to swap out a bathtub for a contemporary glass enclosed shower. This is a particularly good idea for home owners who want to modernize and maximize the space in a smaller bathroom or if you are considering adding an additional bathroom for guests or in the basement. Glass railings in and outside of the house add to an open concept look, while presenting an extremely sleek, modern look to your home that also remains timeless. Open shelves in any room are not only great for achieving an airy look and less visual blockages, they also work nicely to display accent pieces, glassware, photos etc. They are easy to install and affordable, with designs ranging from simple wood slats to shelves with decorative moulding. If you have your custom shower already finished or you’re having it designed, you’ll be glad to know that custom glass shower design is our specialty. We can get very creative with the design and texture of the doors and install them professionally. The whole point of a bathroom retreat design is to make it special. You can do that by separating the bath tub from the shower. A custom designed shower enclosure is the ultimate finish to an elegant master ensuite. Walk in showers have their functional and design advantages. One piece or multi-piece shower stalls are simple to install. The glass enclosures vary in type and most create an expansive, open feel that allows the user to relax and enjoy their shower. This contrasts with showers that are completely enclosed with opaque walls. 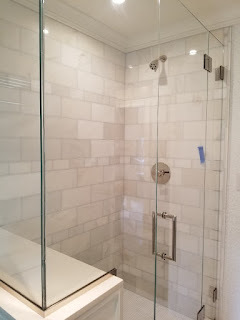 Your shower might have 1, 2, or 3 glass walls, custom glass show door, seating, rain shower faucet, and built in shelving. Another advantage of these fiberglass showers is comfort and safety. There aren’t any rock hard and sharp elements which might be dangerous to some people, including disabled individuals. The foyer is the natural place to start when you’re decorating with mirrors. Just make sure your mirror doesn’t reflect the door or window if you want good feng shui. Consider putting your telephone table in front of the mirror. Add a vase of flowers or some vintage candlesticks to add some elegance to your foyer. If it’s a very small space, you can even put a mirror on the ceiling. That’s especially helpful if the foyer tends to be dark. Any dark space can benefit from mirrors and their light-reflecting properties. But they can also help you make a statement about your style. They can be fun, stylish, elegant or modern – whatever suits your tastes. Maybe you’re really lucky and your sink is under the window. Washing the dishes is that little more enjoyable when you can watch the world go by outside. But if your sink is in the middle of a wall, it can make the kitchen a little dark. 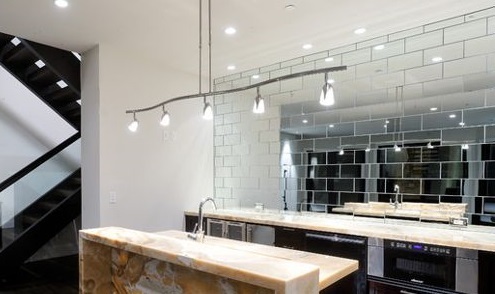 Bring some light to the space by hanging a mirror above the sink. It also has the handy dual function of letting you see what’s going on behind you. So you can keep an eye on the children drawing at the kitchen table. In fact, you can really upgrade your kitchen by hauling out those subway tiles. Add mirrors to your backsplash instead. Bring more light into the kitchen and make those walls recede. It can be tempting to turn a blank wall into a makeshift gallery. A few abstract prints or classy photographs are a simple way to fill the space. But it’s not the only way to use that blank wall. Instead, you can hang a large mirror on the wall. It’ll fill the space. But it’ll also help make the room look bigger than it really is. Still want to have a gallery wall? That’s fine too. Decorating with mirrors doesn’t mean you can’t mix and match. You might hang a small mirror among the decorations and framed photos that you’ve chosen. Or you could collect a variety of ornate frames. Hang a range of them on your gallery wall instead of art prints. 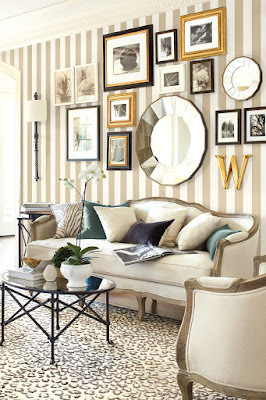 The frames will add interest and the mirrors will earn compliments. And you won’t have to debate over which art style to choose. Do your rooms have really high ceilings? Don’t worry, you can still fill that wall. Tall mirrors are a simple way to occupy all that empty space without overwhelming the room. And if your room is an unusual shape, you can always prop up a mirror in a corner. Or find one with a beautiful stand. There are so many things that we fill our homes with to make our lives livable. Some are functional. Some are fashionable. And then there are those things that just feel like something that you're supposed to have as if your home just wouldn't be complete without them. Mirrors are one of those things. We all have them, and we all know why. Without them, we wouldn't be able to do little things like check our appearances, make sure that our creases are straight before we head out the door. On the design side of things, mirrors are a great way to open up a space, using reflections to make a room feel larger than it actually is. Even in the most straightforward of circumstances, there's always a chance to be a bit creative with your mirrors. In this space, doubling the mirrors is just the start of the fun. It continues into an eye-catching moment of symmetry paired with identically shaped house plants on either side. 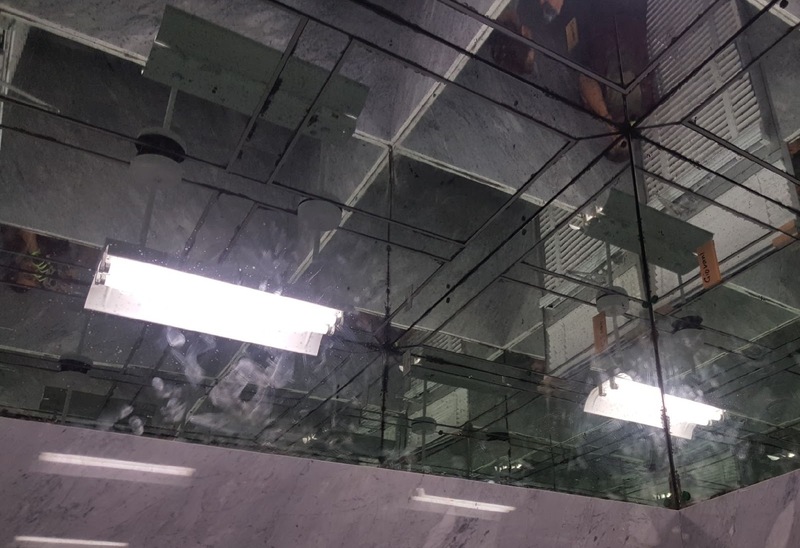 Public areas: Antique mirror, as a decorative glass, is much popular in public places, like lobby, staircases, decorative commercial interiors, elevator walls, etc. Commercial zones: This glass is also used in commercial areas, like; bars, restaurants, hotels, etc. Mirrored wall covering: There are several design solutions to contemporary cover up your mirrored wall. Home or office antique mirror is accepted to both as wall covering. Room dividers: An antique mirror room divider is a perfect idea to divide a bigger space and to do it with style. 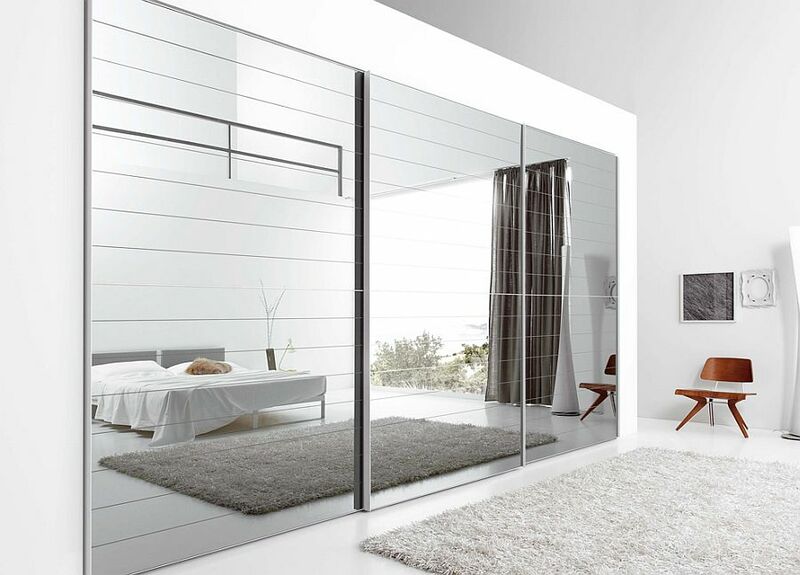 Unlike solid sliding doors or wooden panels, a mirror divider reflects the interior and thus makes it visually bigger. Doors: Just keep in mind that we have an option that suits your personality. If you can’t decide which clear glass you prefer, please come to us and make your interior more suitable with antique mirror glass doors. Mirrored furniture: We offer a superb range of antique mirrored furniture to suit all your needs. From exquisite mirrored bedroom furniture including antique mirrored bedside tables, antique mirrored chests of drawers, antique mirrored dressing tables & antique mirrored console tables, there is something available to bring that wonderful elegance to your home. Cabinet and wardrobe inserts: If your cabinets are viewed on a regular basis, then it is positively important that you have to choose the most appealing and satisfying type of glass, like the antique mirror. You can also install antique mirror as wardrobe doors. Backsplashes: An antique mirror can be used as the kitchen backsplash. Antique mirror glass creates a very attractive feature in kitchens and bathrooms. So if you want to decorate your interior, you could use antique mirror glass. 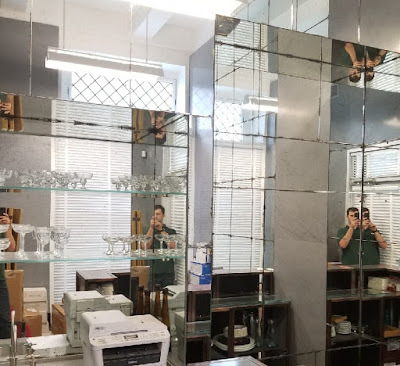 Glass and Mirrors is the best option for your antique mirror glass needs. You can call us at +1 347 921 3356. Contact us. The antique mirror glass creates an authentic decorative retro effect on mirrors that extend design options for the interior. We stock different colors and patterns for antique mirror glass. We are proud of the quality and aesthetic of our antique mirror glass. We are always open to your ideas and welcome to develop different finishes with glass and decorative mirror. At Glass and Mirrors, we can manufacture tiles in any of our antiqued mirror elegant designs and finishes. The antique mirror can be tempered and you can use it in your kitchen or bathroom as a backsplash. Antique mirror tempered glass are all made to your exact size specification. Please provide us with the finish required, along with sizes and quantities and we'll provide you with a price. Have you bought a delicate wood coffee table for your home? And you’re anxious about the harms that will happen over time? The Glass is an efficient material to create an elegant look and prevent your wood table from unwanted damages. Glass table tops can install to your own specifications. There are different prosperity to a glass table top including prevention damages and improved aesthetics. Glass table tops can protect your furniture from blemishes and possible damages. Glass table top is also a problem-free way to give furniture a brand-new and modern look. 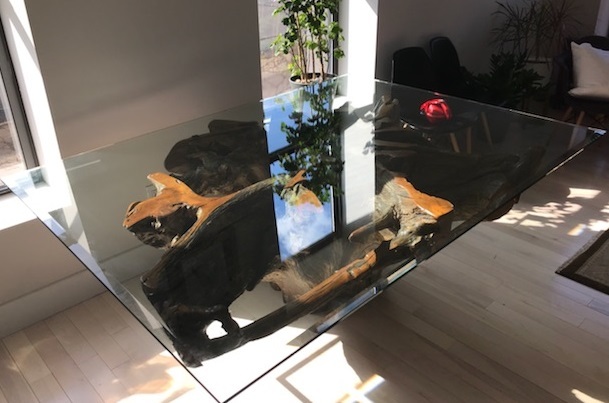 If you need to revive an older piece of wood table without having to deal with color or paint, glass tabletop is the intense solution for it. Glass table tops add an extra gleam to your old fashioned wood table. Glass table tops would look great on a dresser, countertop, dining table top or a coffee table top while also making it easy to clean them. It is also best for restaurant decoration. Glass table tops can refresh an older, worn cost of furniture without redecorating or modify the piece in any way. 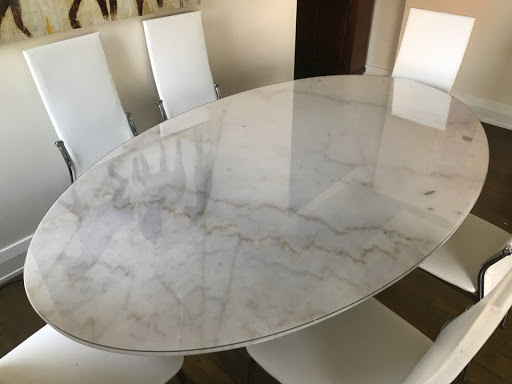 Glass table top protects the materials made, like: wood furniture or table linens from moisture, fungal damages or stains – and it is also easy to clean-up. Glass made table tops spontaneously renovate or merge a design with hue. They give all the elegance and practicality of a glass countertop, with a cost-effective fine or light piece of glass. We also provide installation service too. Our specialty in glass tables and table tops. Whether you’ve purchased a new home and a new home requires a great bathroom interior. You can install a glass shower door to get an elegant look to your bathroom interior. If you can complete the remodel before you move in, you’ll save your time and a huge inconvenience. If your guest bathroom is less than impressive, maybe it’s time for an upgrade. Create a “wow” factor by adding a fresh coat of paint and swapping out the shower curtain for a door with patterned or textured glass. So if you want to remodel your old shower room or want to install a new one, then Glass and Mirrors is the best choice for you. 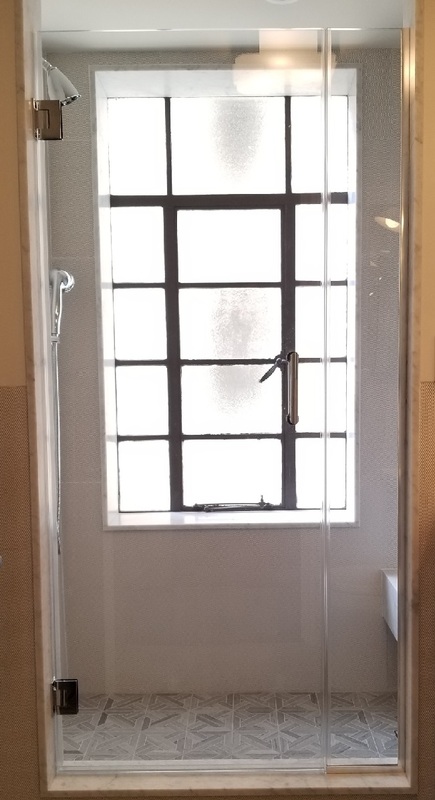 We do custom shower door only for 7 days. Hurry up! 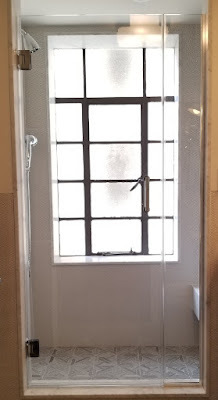 To order your Shower door Contact Us. The shower, as a bathroom equipment, is playing an increasingly important role in the interior of the bathroom and is a part of the overall design. One of the most popular tricks to visually enlarge the size of the bathroom is the use of absolutely transparent walls of the shower. Frameless shower doors can create a clean, modern and seductive look in your bathroom. 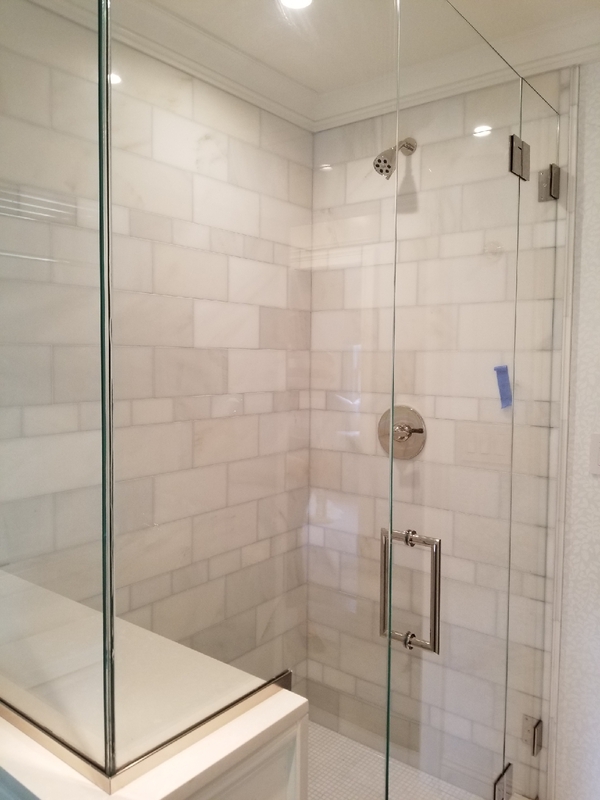 Shower doors can have diverse designs and it would depend on the size of the bathroom, the architectural and structural issues, the design and of course, the personal taste of the homeowner. Frameless shower doors look modern, and sleek and add a light and airy look to the bathroom. People who opt for frameless shower doors point out the elegant appearance and sleek and modern design. A frameless glass shower door makes a bathroom look bigger and does not hide a beautifully tiled shower. The airy look fits well in modern and minimalist-style bathrooms. The relatively easy maintenance is another of the advantages of choosing frameless doors. The lack of metal frame also means that there is no risk of erosion or rust. Generally, frameless glass shower doors are made of thick glass which makes them very durable. The use of frameless shower enclosures and cabins provides an opportunity to create a feeling of space even in small bathrooms. 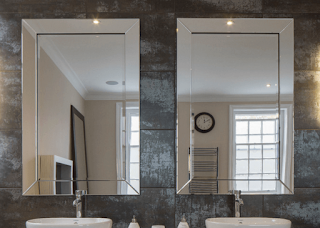 Generally, glass can give any bathroom, with modern or traditional design, a feeling of sophisticated style, which can be enhanced with appropriate accessories and lighting. Glass shower enclosures are easy to install and easy to maintain. And it is easy to install. 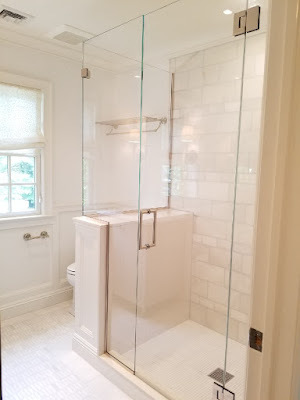 Glass and Mirrors provides the quality and custom glass shower door at your budget price in Brooklyn, NY. Smile in the Custom Antique Mirror. Do that every morning and you will be able to view big differences every morning. Everyone knows the basic importance of an Antique mirror glass installed in a house. Very few have the taste of understanding the versatility and elegance of this beautiful piece which can enhance the outlook of the interior decor of your house. There is a huge availability of different types of custom antique mirrors which will perfectly blend in and complement the interior designing and structure of the house. What is an Custom antique mirror? People who are highly fanatic for vintage art and decor always seek for relics that will speak for their taste. That is where you will become a paramour of antique mirror glass. Antique mirror is one of the most impeccable ornaments that infuse great art to your interior decor. For the interior decor, the antique mirror is bordered with the wooden frame where there are beautifully artistic carvings depending on the taste of the vintage decor fanatic. 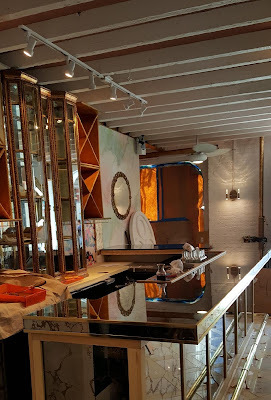 Where can you place these Custom Antique mirrors? 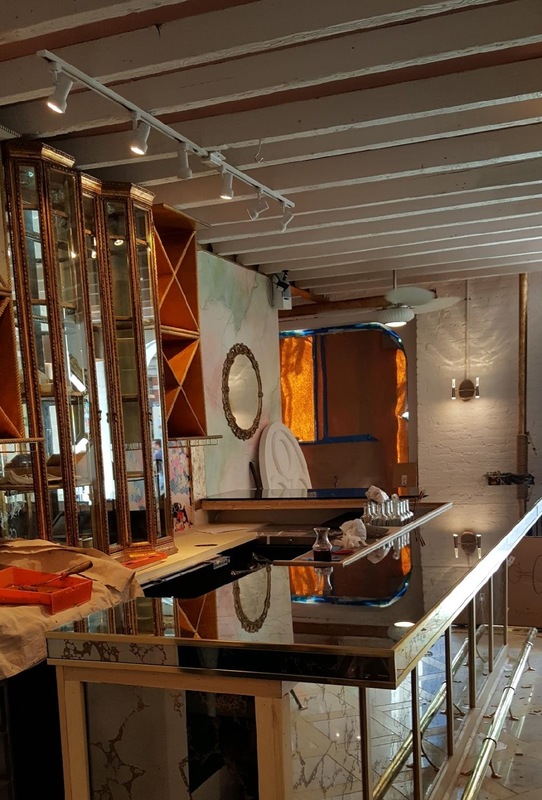 Glass and Mirrors by Giovani Glass is the place where you can collaborate to receive the modern decor of your house with complementing vintage features. Country styled homes or the ones with old-fashioned house decor can implement the use of an antique gold mirror. Custom Antique mirror’s shiny outlook and the quality will itself speak alluring words for you. The reflection of such beautifully crafted antique gold mirror is highly dynamic and creates an aesthetically amazing experience to the entire room. As rightly quoted, “Old is Gold”, there are several ways where you can portray the appeal of the antique mirror glass in the bedroom or the entire peripheral of the house. You can embellish the dining room with the complementing looks of Custom antique furniture and gold mirror. There are even ornamented mirror furniture that can be placed in a quality space to collect the steely attraction and attention of your guest. There are so many ways where you can showcase the appeal of the antique mirror glass in your house. The antique mirrors can be framed as per the taste and preference of the homeowners and their house designing. If you have a contemporary or modernistic approach or design, outline the mirrors with wooden frames that will change the entire panorama of the room. 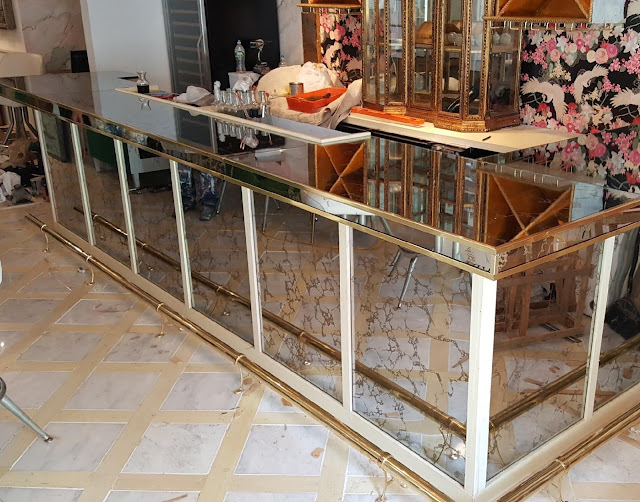 So if you also yearn for creating such beautiful and artistic decor in your house with antique mirror glass and custom antique furniture; get in touch with the best company. The best company like Glass and Mirrors will serve your needs for any mirror glass. Digitally Printed Laminated Glass Considered to be one of the most popular material for the architectural purpose, glass most widely opts material for the homeowners. People are getting attracted to the concept of laminated glass. With the advancement in designing, the designers have formulated new ways to create different prints on the laminated glass. Basically, laminated glass is synonymous with security glass. There are different types of glass which can be laminated and can be formulated into furniture, backsplash, and different glass printing services. Glass and Mirrors assures you in providing the quality product without any flaws. Where can you use printed laminated glass? There are so many areas where you can use printed laminated glass. Glass art print has become highly popular in the enhancement of the interior decor of the house. Not only personal, people are also looking forward to creating their commercial space, classy and elegant with the implementation of digitally printed doors. 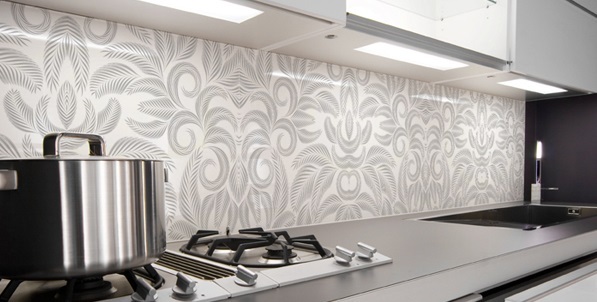 From digitally printed doors to printed kitchen backsplash, the fusion of printed lamination glass is bound to gain steely glances from your peers and guests. For the kitchen backsplash, you can opt for laminated glass art print. Not only it enhances the entire look of your modular kitchen but also it is very easy to maintain. You can easily wash and clean the kitchen glass backsplash. Or you can even opt for a big glass feature wall. One side of the wall of the bathroom or the connection of hallway to the living room can be embellished and ornamented by laminated digital glass prints. It is not only durable but also leaves a lasting impression. Is there any customization available? Of course, that is another interesting decor to complement the ornamentation of your home. If you are wondering how you can even customize the printing on the glass as per your requirement and needs. The professionals are going to be there to take your photographs or take up the digital image. They will formulate the best glass photo printing which you can install in your living room or in your personal space. Adding a glass table top for your interior decoration is a convenient and trendy way to protect your wooden desk or table from wear, tear, and sun damage. The glass can be used to top a piece of furniture or as a custom top for any table base. You can choose from a wide array of thicknesses and edge finishes to complement any furniture style from modern to heirloom. Call the experts at Glass and Mirrors at +1 347 921 3356. We’ll help you design the perfect glass tops and make sure they are cut to fit. There are 4 Reasons to Choose Glass and Mirrors by Giovani Glass your glass table tops. The glass table tops help protect furniture from stains, spills, water rings and daily wear and tear from the sun. Glass prevents UV damage that falls on the wooden furniture due to direct sunlight for several years. If you find it difficult to choose a table that has different colors, patterns, and styles, then using custom glass table tops are your ideal option. 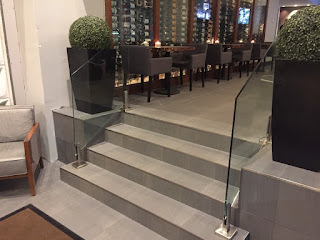 It is a good equalizer because glass helps develop most design styles. Besides, a glass will make your room look modern and stylish for several years, which, in turn, will help avoid expensive modifications. A glass piece when placed on a table made from another material will be easy to clean and maintain. You will need a dry cloth and a cleaner for cleaning glass table top and maintaining its shine. It will be quite easy to get rid of dirt, dust, water rings and food spills. Besides, glass table tops avoid stain marks setting into the wooden furniture. You may use glass table tops for furniture upgrading. A traditional kitchen table can be covered with a glass top that will help transform a classic design into a modern one. Finally, you may add glass table tops in any part of your home. Glass is a material that will make the room look modern and stylish for many years. The best part of choosing them is that they improve the aesthetics and functionality of your home. Glass table tops add classiness to your valuable property and help avoid expensive upgrades. Their transparency virtually imparts a spacious look to your rooms. Glass and Mirrors is one of the best reliable company for your kitchen, bedroom, dining room glass table top installation and fabrication. Want to install custom glass table tops for office purpose? Any specification, any design, and any shapes are possible for your glass table top.